The Associated Press reports that Michigan has passed legislation that would allow students to fulfill a graduation requirement by taking a financial literacy course. Students now must pass a half-credit economics requirement to graduate. The legislation approved unanimously by the Senate Thursday would let the credit requirement be satisfied by completion of a personal economics class that includes a financial literacy component. As the 2016 state legislative sessions approach in states across the country, let's hope more states follow Michigan's lead. September is Life Insurance Awareness month and LIMRA is out with their 2015 "Facts About Life." This annual fact sheet is always a great source of information about consumers and financial security. One interesting nugget in this year's report concerns online purchase of financial products like life insurance. According to LIMRA, "while 71 percent of Americans say they research online, more than half want to work with a financial professional to purchase life insurance." Consumers' strong preference to receive financial advice face-to-face is one reason we must all do our part to ensure every community has access to financial experts. 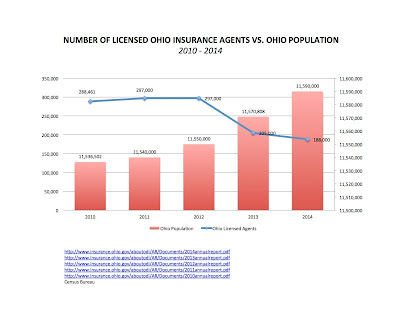 The Coalition for Financial Security (CFS) recently completed research into the licensing of insurance agents in Ohio. Using FOIA documents from several states and other public information, the research suggests Ohioans seeking a license to work in insurance have to jump over higher regulatory hurdles than their neighbors. These regulatory hurdles have negative consequences for job-seekers and consumers in the Buckeye state, and regulators may want to consider action. The research is summarized in the following three charts. 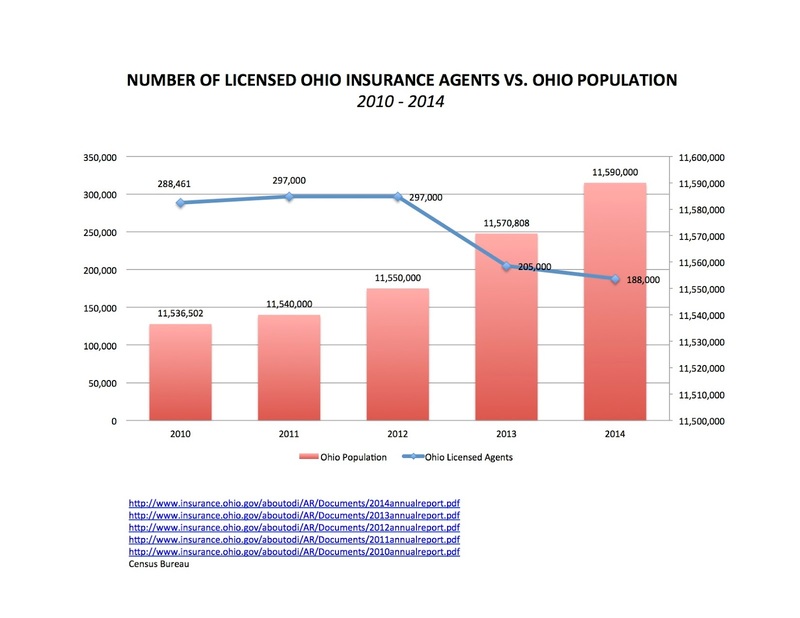 The first chart uses information from the Department’s annual reports and the U.S. Census Bureau to document a decline in the number of Ohio insurance agents, even as the state’s overall population has grown. 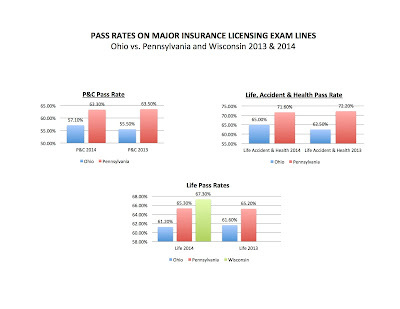 The second chart compares first-time pass rates on insurance licensing exams in Ohio, Pennsylvania and Wisconsin (where available) on three major exam lines: (1) Life, (2) Life, Accident & Health and (3) Property & Casualty. 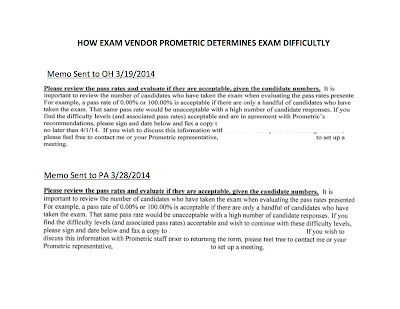 All three states use the same exam vendor, Prometric. (Wisconsin contracted with Prometric in 2014.) 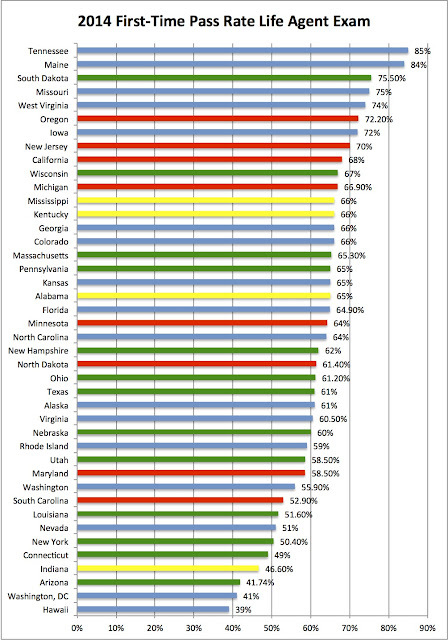 Note from the chart that Ohio consistently has the lowest pass rate on the various licensing exams. 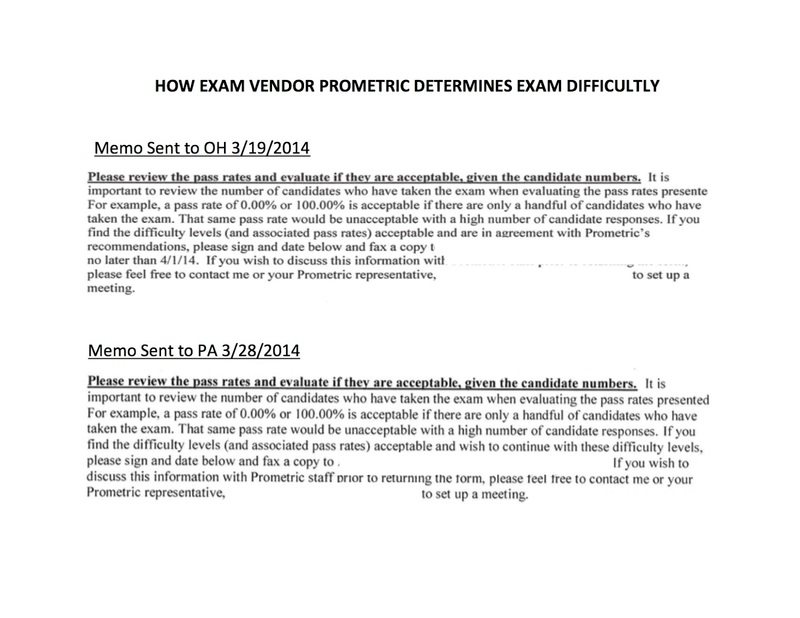 The final chart includes excerpts from memos sent by exam vendor Prometric to both the Ohio department and the Pennsylvania department. 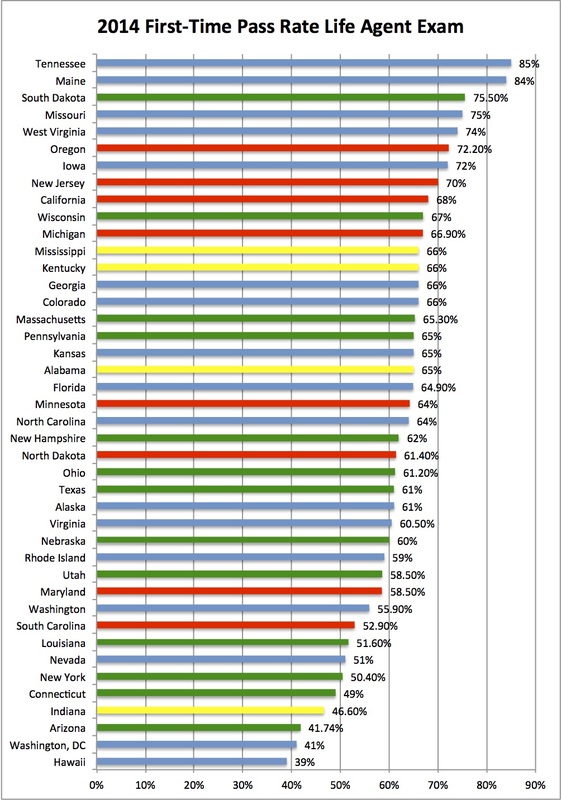 The excerpts make clear that Prometric sets exam difficulty in each state based on what pass rates regulators find "acceptable." If regulators want a higher or lower pass rate, the memo says they can adjust the difficulty. One can reasonably conclude from these memos and the pass rates in Ohio and other states that regulators in Ohio have have chosen a different difficulty for their exams. In light of the declining population of insurance agents, Ohio may want to work with Prometric to ensure the bar to enter the insurance profession in Ohio is the same as it is in Pennsylvania and Wisconsin, or to at least determine if there is a public policy reason for it to be different. Jobs and consumers' access to insurance products are at stake. Importantly, it appears Ohio can reducde its licensing burden without jeopardizing consumer protection. Looking at state consumer complaint ratios, there appears to be no correlation between exam pass rates and consumer protection. There is, however, strong evidence that the consumers will benefit from a more robust agent population. A 2010 LIMRA survey the life insurance market found that “almost eight in 10 U.S. households currently do not have a personal life insurance agent or broker to turn to and most of them say they never did.” The recent licensing report from the White House (noted in previous blog entry) also suggested unnecessary licensing hurdles "[raise] costs for consumers." Finally, it is interesting to note that the vast majority of licensed agents working in Ohio are non-resident agents. Thus any extra hurdles in Ohio would have very little impact on consumers, as many are working with agents licensed in other states. Indeed, instead of bringing consumers added protection, extra hurdles may in fact only be punishing Ohio residents. This blog has long covered the potential link between barriers to entry in the insurance profession and some communities' lack of access to important financial products. The White House today issued a report on Occupational Licensing that makes a similar report about all professionals where licensing is required. While licensing can bring benefits, current systems of licensure can also place burdens on workers, employers, and consumers, and too often are inconsistent, inefficient, and arbitrary. The evidence in this report suggests that licensing restricts mobility across States, increases the cost of goods and services to consumers, and reduces access to jobs in licensed occupations. The employment barriers created by licensing may raise wages for those who are successful in gaining entry to a licensed occupation, but they also raise prices for consumers and limit opportunity for other workers in terms of both wages and employment. 2. Make sure that substantive requirements of licensing (e.g., education and experience requirements) are closely tied to public health and safety concerns. 3. Minimize procedural burdens of acquiring a license, in terms of fees, complexity of requirements, processing time, and paperwork. CFS conducts an annual survey of states to determine the first-time pass rate on various insurance agent licensing exams. 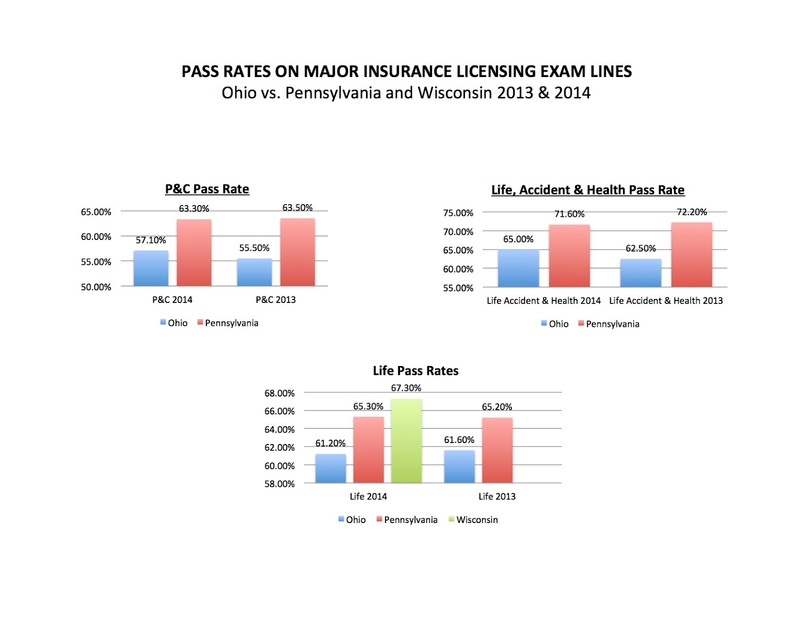 The chart below shows pass rates for Calendar Year 2014 on Life Agent licensing tests. The results are color coded by the exam vendor each state uses: Blue for Pearson; Red for PSI Exams; Green for Prometric and Yellow for other. As the chart illustrates, the pass rates are all over the map. They suggest one’s ease of entry into the life insurance profession depends in part on where one lives. For example, it is not clear why only 4 in 10 Indianans get a license on their first shot, when in Michigan, 7 in 10 do. Are people in Michigan smarter? Or are regulations in Indiana making entry into the profession more difficult? If so, is there a good public policy reason why? One of this organization’s goals is promote policies that help to ensure every community has access to financial tools and advice – including agents who represent a vital link to products like life insurance. In pursuit of that goal, CFS has looked at the licensing process and tried to shine a light on unfair barriers to entry that might be preventing some from getting a license. While licensing is important and meant to protect consumers, consumers are not protected if the pool of professionals on which they can rely is artificially limited. CFS has found that pass rate on a state’s licensing exam is good proxy for licensing fairness. While the organization looks at pass rates for many professions, the life agent pass rates are particularly useful, as the laws governing a life agent are consistent across states. This is an important consumer issue. LIMRA’s 2010 survey of the life market found that “almost eight in 10 U.S. households currently do not have a personal life insurance agent or broker to turn to and most of them say they never did.” Among Hispanic and working class households, the lack of reported contact with an agent was even higher. With life insurance usage so low, and Americans searching for individuals to talk to, public policy makers owe it to their constituents to ensure that qualified individuals seeking to work in the profession can get a license without unnecessary regulatory hurdles. Source documents for this survey will be provided to any one upon request. The WSJ covers an EBRI analysis of auto-enrollment policies and whether such policies are enough to solve the retirement crisis. The answer? Not really. Not if the auto savings rate is 3%. EBRI, a nonpartisan think tank, modeled savings behavior by age group and employer size and found that an automatic 3% deduction without the possibility of opting out would reduce the total retirement savings shortfall for households headed by someone ages 35 to 64 by 6.5%, from $4.13 trillion to $3.86 trillion. The Topeka Capital-Journal recently editorialized in favor of financial literacy legislation, stating that "the 2016 legislature should make a financial literacy curriculum mandatory in the state's public schools." That sounds like a great idea. Kansas’ older residents learned much about handling their personal finances from their parents. Many youngsters still get that type of education at home. Unfortunately, many others don’t and are ill-equipped to make good decisions about money, credit and borrowing at an age when knowledge of such things should be very important to them. If that sounds like dumping another responsibility on schools that parents could, or should, handle at home, it is. But the need is there. The National Conference of State Legislators has encouraged all states to adopt statutes requiring the study of financial literacy in public schools. Here's hoping more states (and their newspapers) follow this lead. Should we think about retirement differently? This article from CNBC.com questions whether we should start thinking about retirement differently. Based on a recent survey, the article questions if people aren't retiring at 65, should our policies and approach to retirement change too? It may be time to redefine retirement. A new survey of American workers from the Transamerica Center for Retirement Studies found that 82% of the respondents age 60 and older either are, or expect to keep working past the age of 65. Among all workers, regardless of age, 20% expect to keep on working as long as possible in their current job or a similar one. The Department of Labor is back with its proposal to change the rules of the road for retirement investors. As always, what sounds good may have unintended consequences. This is a point made today in Think Advisor. Consumer protection is an important goal; and where there’s money, there are unscrupulous people. The fiduciary standard may bring a higher level of service to some investors, but it may also inadvertently leave many out in the cold. [The result of the rule] will be the disenfranchisement of smaller investors, as most advisors and their firms conclude that the modest fees garnered from servicing these clients do not justify the heightened potential liability. Experts suggest this debate is going to take awhile, so it bears watching. Today, Florida lawmakers will be introducing legislation to require financial literacy in the state's high schools. Lawmakers, business leaders, teachers, and students will meet to introduce House Bill 29 and Senate Bill 92, the “Money Course” in High School Bill, a half-credit, required course on financial literacy for all public high school students in Florida. Press conference begins 1 p.m. at the House Press Room (Room 333), Third Floor of the Florida Capitol. Having legislation introduced is a long way from having legislation signed into law, but this is worth watching as 2015 unfolds.